If you have old bicycles that you no longer need or want, consider donating them to a worthy cause. Organizations that recycle bicycles not only keep bikes out of our landfills, but help needy people with transportation and recreation. If your bicycle is rideable, or only in need of minor repairs, many organizations will accept your donated bike and pass it along to someone who needs and wants it. If you bicycle is unrepairable, its parts are still of value for repair of other bikes, or its materials may be able to be recycled. 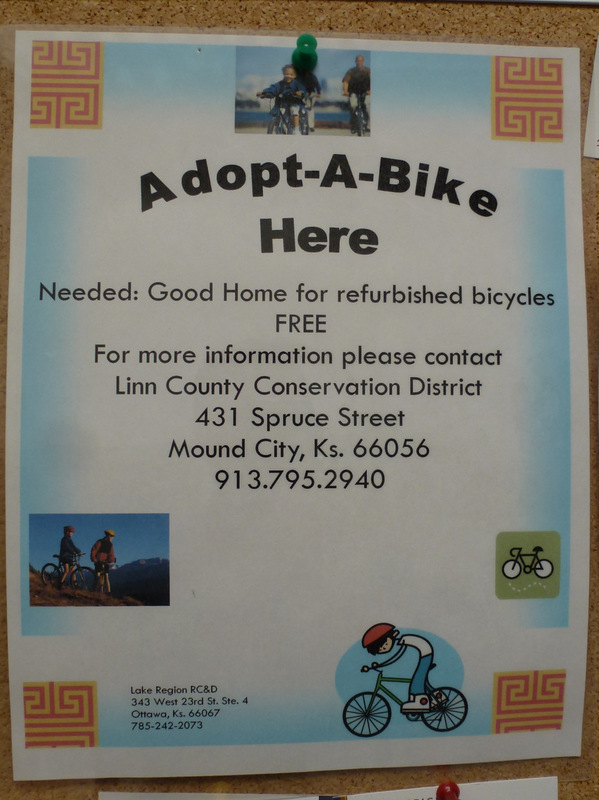 The Adopt-a-Bike program in Mound City is run by the Linn County Conservation District, which helps to keep bikes out of the landfill and finds a good home for refurbished bikes. Drop off bikes at 431 Spruce Street in Mound City, Kansas 66056. Contact at 913-795-2940. The Campus Christians Club at Pittsburg State University accepts donated bicycles, which they refurbish for International Students. For details, contact Don Smith at dsmith@ccpsu.org or 417-529-6470. FreeWheels for Kids in Kansas City, Kansas accepts bicycle donations and collects used bikes year-round. They accept donations at Rosedale Development Association. The Revolve Community Bike Shop in Kansas City, Kansas accepts bicycle donations at their location at Located at 554 Central Ave., Kansas City, KS 66101. 816-835-3310. "Revolve always needs bicycles in any condition. Bicycles that can not be refurbished are stripped for usable parts and the metal is recycled." The Southeast Kansas Recycling Center accepts bicycles for recycling or resale through their "New To You Resale Shop". Located at 615 S Joplin St, Pittsburg KS. 620-231-8930. The Topeka Community Cycle Project "promotes self-reliance, sustainability, and healthful living in Topeka through the recycling, repurposing, and distribution of bicycles." Bicycle donations can be dropped off at 423 S. Kansas Avenue in downtown Topeka. Bicycles that cannot be safely refurbished will be stripped for parts in order to give new life to more suitable bicycles and anything that cannot be reused will be recycled. Each year, Toys For Tots and the Bicycle Pedaler collect and repair bikes for kids in the community. "It is suggested that people wishing to donate used bicycles either contact Wichita Toys for Tots or call the Bicycle Pedaler at 316-685-4545 prior to dropping of used bicycles." Variety of Greater Kansas City hosts an annual Bike Bonanza in the Kansas City metro area. Donors can drop off bikes at designated locations. "If you would like to donate a gently used bike, simply email varietykc@gmail.com or call 913-558-2309"
In addition to the programs listed above, many community organizations, such as the American Legion, Elks Club, Goodwill, Knights of Columbus, Lions Club, Ruritans, Salvation Army, VFW, and many more will either accept bicycles donations, or be able to advise you about where to drop off. Also, many communities hold yearly recycling events that will accept used bikes. According to KansasRecycles.org, bicycles are accepted for recycling in the following communities: Caldwell, Concordia, Glasco, Kansas City, Kiowa, La Crosse, Leavenworth, Leawood, Lyons, Pittsburg, Shawnee, Topeka, WaKeeney, and Wichita. Another good resource is your local bike shop, who should be able to offer some suggestions for donating your bicycle. Please contact your city, or nearby organizations, to get the details of what is available where you live.